It’s October! October means falling leaves, Halloween delights, and a particular brand of puzzle that can only be enjoyed outdoors: the corn maze. 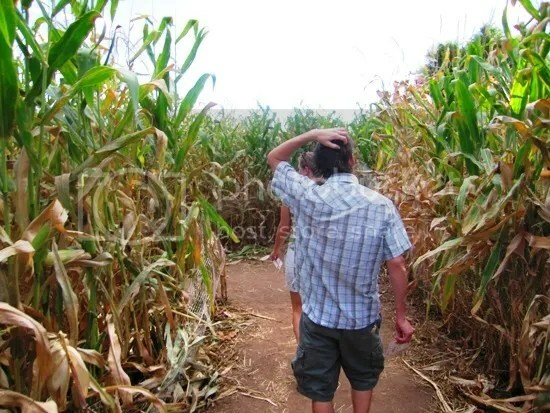 The corn maze is a seasonal hall of mirrors, a mental challenge that envelops you like few puzzles ever will. 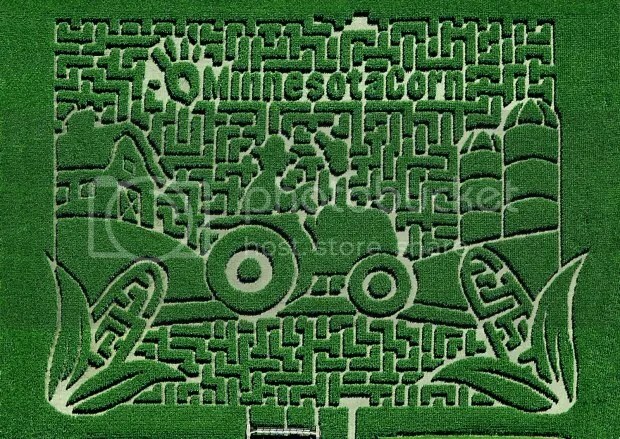 Whether it’s a simple series of twists and turns designed for kids, or an elaborate design for adults whose true complexity can only be appreciated from above, corn mazes are a terrific puzzly experience for the whole family, and October is prime corn maze season. Friend of the blog Cathy Quinn passed along an article from the Boston Globe featuring bits of trivia on numerous New England corn mazes, covering such curiosities as the machetes wielded by the Hanson’s Farm crew and the precautions taken by Marini Farm’s maze masters, including phone number to call and GPS assistance available for lost maze-goers. But for someone looking for a puzzle with a bit more bite, worry not! 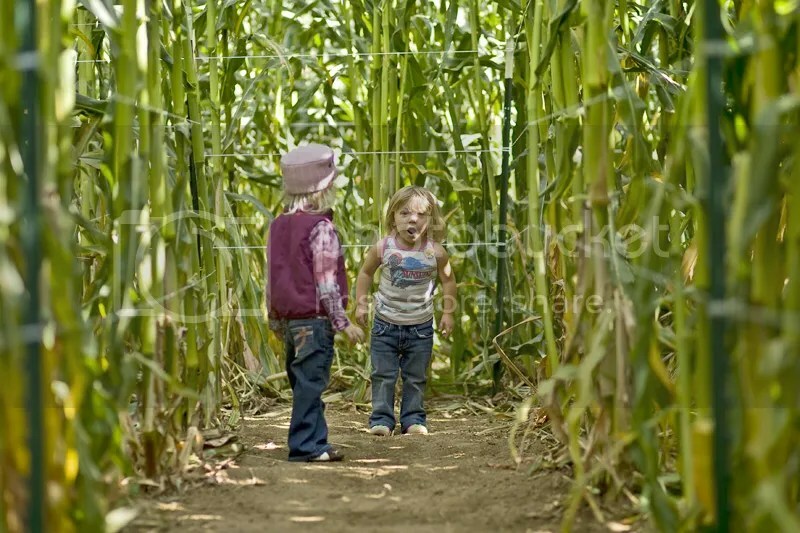 Some truly devious corn maze designers cook up extra challenges for the brave of heart and sharp of wit. 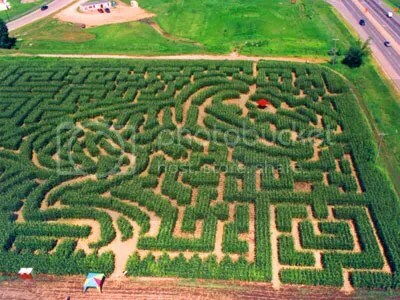 The corn maze found at Pennsylvania’s Cherry Crest Farm, for instance, has three levels of difficulty, each demanding more puzzle skill and problem-solving acumen than the one before. Their easy version is a basic run-through the maze (indicated with yellow trail markers), while their intermediate one features orange clues to unravel that guide you through a more complicated path. And their most difficult run? Well, that one requires you to collect every piece of a scattered map and every Kernel of Knowledge along way, tackling the mental obstacles that accompany every red clue. The article doesn’t mention it, but when you go in, they hand you a list of 10 trivia questions. As you wander the maze, you can come across up to 20 signs giving possible answers, so you have to figure out which answers are correct. 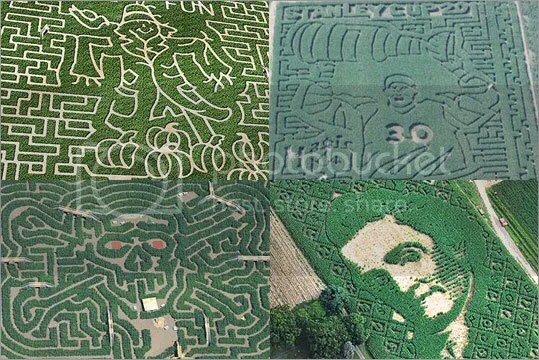 Are there any great corn mazes near you, fellow puzzlers? Let me know! Share pictures! I’d love to see them!